Um dos grupos mais respeitados e influentes do debate rastreio contínuo do câncer de mama disse nesta terça-feira que as mulheres devem começar a realizar as mamografias mais tarde e com menor freqüência do que vinha defendendo há muito tempo. A American Cancer Society, que há anos defende uma abordagem mais agressiva para o rastreio do câncer de mama pela mamografia, divulgou novas diretrizes na terça-feira, recomendando que as mulheres com um risco médio de câncer de mama começem a realizar as mamografias aos 45 anos e continuar realizandoas uma vez por ano, até os 54 anos. E, em seguida, a cada dois anos durante o tempo que as mulheres se apresentem saudáveis ​​e tenham probabilidade de viver mais 10 anos. A organização também disse que não mais recomenda o exame clínico das mamas, no qual médicos ou enfermeiras palpam as mamas para detectar caroços, para mulheres de qualquer idade que não tenham qualquer sintoma ou anormalidade nas mamas. Anteriormente, a sociedade recomendava as mamografias e os exames clínicos anuais de palpação das mamas, a partir de 40. As alterações reflectem as evidências crescentes de que a mamografia é imperfeita, que é menos útil para mulheres mais jovens e que tem sérias desvantagens, como resultados falsos-positivos que levam à realização de exames adicionais, incluindo biopsias. Mas a mudança da organização parece improvável para resolver a questão. Alguns outros grupos influentes recomendam rasteris mais precoces e mais freqüente do que a sociedade do câncer agora faz, e alguns recomendam menos, deixando as mulheres e seus médicos para classificar as mensagens conflitantes e para descobrir o que faz mais sentido para as suas circunstâncias. Na verdade, embora as novas diretrizes parecam diferir significativamente das antigas, a American Cancer Society temperou cuidadosamente sua linguagem para deixar bastante espaço para as preferências das mulheres. Embora já não recomende mamografias para mulheres com idades entre 40 a 44, dizem que as mulheres ainda devem “ter a oportunidade” para que o exame se realize, caso elas queiram, e que as mulheres com 55 anos ou mais devem realizar as mamografias uma vez por ano . Este ano, 231.840 novos casos de câncer de mama invasivo e 40.290 mortes pela doença são esperadas nos Estados Unidos. As novas diretrizes foram publicadas na terça-feira no Journal of the American Medical Association, juntamente com um editorial e um artigo sobre os benefícios e riscos do rastreio, que forneceram as evidências para o artigo separado guidelines. O editorial sobre o assunto também foi publicados em outra revista, JAMA Oncology. 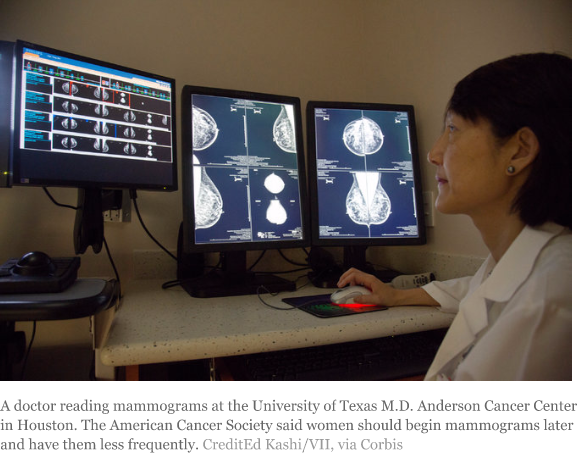 One of the most respected and influential groups in the continuing breast-cancer screening debate said on Tuesday that women should beginmammograms later and have them less frequently than it had long advocated. 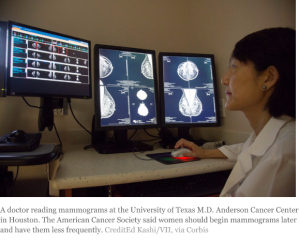 The changes reflect increasing evidence that mammography is imperfect, that it is less useful in younger women, and that it has serious drawbacks, like false-positive results that lead to additional testing, including biopsies. But the organization’s shift seems unlikely to settle the issue. Some other influential groups recommend earlier and more frequent screening than the cancer society now does, and some recommend less, leaving women and their doctors to sort through the conflicting messages and to figure out what makes the most sense for their circumstances. In fact, although the new guidelines may seem to differ markedly from the old ones, the American Cancer Society carefully tempered its language to leave plenty of room for women’s preferences. Though it no longer recommends mammograms for women ages 40 to 44, it said that those women should still “have the opportunity” to have the test if they choose to, and that women 55 and older should be able to keep having mammograms once a year. This year, 231,840 new cases of invasive breast cancer and 40,290 deaths are expected in the United States. The new guidelines were published on Tuesday in the Journal of the American Medical Association, along with an editorial and an article on the benefits and risks of screening, which provided evidence for the guidelines.A separate article and editorial on the subject were also published in another journal, JAMA Oncology (transcrito abaixo). Given the time, expense, and strong clinician and patient viewpoints, it is unlikely that any large-scale randomized clinical trial on mammography will ever be done again. Therefore, important clinical questions regarding the efficacy of mammography screening will need to be answered using observational data and modeling, even when those questions would really best be answered in randomized clinical trials. Using observational data from the Breast Cancer Surveillance Consortium including 15 440 breast cancers (3340 ductal carcinomas in situ [DCIS] and 12 100 invasive), Miglioretti et al1 try to address the question of whether annual vs biennial screenings are superior. Although there is still controversy in the United States regarding this issue, most developed countries outside of the United States recommend screening every 2 or 3 years for eligible women, including the United Kingdom,2 Canada,3 and Australia.4 The advantages of biennial screening from a population perspective are clear: reduced health care costs and decreased risk of false-positive screening results with the attendant extra biopsies and procedures.5 Furthermore, the improvements and widespread implementation of adjuvant breast cancer treatments have called into question how much of the recent decrease in breast cancer mortality is due to screening and how much to treatment advances, since these changes occurred contemporaneously.6 Nevertheless, concerns have arisen regarding cancers that would be missed with biennial screening. The current study1 shows that the breast cancers that develop in women change with age and menopausal status. With annual screening, women ages 40 to 49 years had a higher chance of developing a stage IIB or higher cancer compared with women ages 70 to 85 years (21.3% vs 13.6% for ages 70-85 years, respectively). Similar results were seen when stratified by menopausal status. Furthermore, the relative risk of developing a “less favorable” tumor comparing biennial vs annual screening was similar across age groups, yet was statistically different by screening interval among premenopausal women but not postmenopausal women. The authors1 posit that menopausal status reflects a more relevant biologic parameter than chronologic age and therefore may be a more useful guide for breast cancer screening recommendations rather than chronologic age. Although the authors1 do not endorse annual or biennial screening, they imply that biennial screening would be acceptable for postmenopausal women but inferior for premenopausal women owing to their findings of a higher proportion of “less favorable” cancers with biennial screening in that subgroup. Less favorable was defined as stage IIB or higher, size greater than 15 mm, positive lymph nodes, and a measure of 1 or more of these characteristics, but this way of thinking may becoming outdated. Similar to the authors’1 contention that menopausal status is a more relevant biologic marker than age, newer studies have called into question the prognostic importance of size and stage, which are anatomically derived constructs, compared with derivations based on tumor subtypes. For example, on the one hand, recurrence scores based on gene expression array testing are stronger predictors of distant recurrence than tumor size in multivariate models.7 The National Comprehensive Cancer Network (NCCN) guidelines8reflect this trend, with adjuvant treatment decisions for estrogen receptor (ER) positive/HER2-negative node-negative tumors based on recurrence score testing rather than tumor size. On the other hand, triple-negative tumors will have a poorer prognosis, even when they are node negative and smaller than 1 cm at diagnosis. A study9 of 4113 women with stage T1a/bN0 breast cancer treated between 2000 and 2009 at NCCN centers showed a 5-year invasive disease–free survival of 91% and 88% for triple-negative breast cancers with chemotherapy, which is lower than would be expected for hormone receptor (HR)-positive cancers with limited nodal involvement. Current NCCN guidelines8 recommend adjuvant chemotherapy for node-negative triple-negative breast cancers larger than 1.0 cm and consideration of adjuvant chemotherapy for tumors 0.6 to 1.0 cm in size. Therefore, measures of tumor size and nodal status may not be the best way to accurately categorize tumors as less favorable and may end up misclassifying many tumors. Related to the underlying biologic characteristics of the tumor, the sensitivity of the tumor to current adjuvant therapies helps to determine whether a tumor is less favorable. Before the widespread use of HER2-directed therapies, HER2-positive cancers clearly had a worse prognosis compared with HER2-negative cancers of a similar stage. Even when lymph node–negative, HER2-positive cancers had a higher likelihood of developing distant metastases and resulting in death from breast cancer compared with HER2-negative breast cancers.10 The introduction of trastuzumab changed the landscape of HER2-positive disease with the clinically significant impact of adjuvant trastuzumab in decreasing risk of distant recurrence and improving disease-free survival.11 A recent prospective trial of node-negative HER2-positive cancers treated with adjuvant trastuzumab and paclitaxel showed invasive disease–free survival of 98.7% at 3 years. The study population was equally divided between tumors smaller than 1 cm or 1 cm or greater, and survival was high in both groups, suggesting that tumor size was a less important prognostic factor with effective adjuvant therapy.12 Similar conclusions can be drawn from the neoadjuvant trials using trastuzumab-based chemotherapy. In an analysis13 of the NeoAdjuvant Herceptin (NOAH) trial in which 235 women were randomized to either chemotherapy alone or chemotherapy and trastuzumab, the achievement of a pathologic complete response after treatment with chemotherapy and trastuzumab was a better predictor of 5-year event-free survival (EFS) than nodal status at presentation. For patients treated with neoadjuvant chemotherapy and trastuzumab, 5-year EFS was 60% for node-negative patients and 57% for node-positive patients. In contrast, 5-year EFS was 87% for those who achieved a pathologic complete response after neoadjuvant chemotherapy compared with 38% for those who did not.13 Although pathologic complete response is an imperfect surrogate for long-term clinical benefit, the likelihood of a complete pathologic response with neoadjuvant treatment varied more by tumor subtype rather than by tumor size or nodal status at presentation.14 Therefore, for HER2-positive breast cancers, nodal status and tumor size may have less impact on prognosis than sensitivity to HER2-directed therapy. Another finding of this study1 was the higher proportion of DCIS among women who were 40 to 49 years old or premenopausal compared with older women. This highlights the fact that the underlying tumor biologic changes over time. The Surveillance, Epidemiology, and End Results (SEER) registry data shows that the distribution of tumor subtypes changes with age, with a higher proportion of HER2-positive and triple-negative tumors among younger women compared with older women.15 To optimize “risk-based screening,” studies should focus at difference in tumor subtype by screening interval, age groups, and menopausal status rather than differences in stage. This study1 and others have clearly demonstrated that with less frequent mammography, the tumors will be bigger and have a slightly more advanced stage. However, with our better understanding of tumor biology and improvements in targeted therapy, the best way to optimize the risk and/or benefit of screening may not be to maximize the chances of finding a smaller tumor. Instead, efforts should be focused on a better understanding of how screening interacts with tumor biology with a better understanding of the types of interval cancers and sojourn times and how these characteristics differ by age and/or menopausal status. Owing to its biologic heterogeneity, breast cancer presents a unique challenge for screening implementation. There are different ways to conceptualize when cancer screening works best, but one way is to consider the following 4 categories: (1) cancers that are curable with treatment at the time of clinical presentation so screening is not needed, (2) cancers that are curable after screening but not curable if we wait until clinical presentation, (3) cancers that will be incurable regardless of whether detected with screening or clinically, and (4) cancers that are unlikely to cause death even without treatment.16,17Screening works best for cancers that fall in the second category, such as cervical cancer. Breast cancer, however, falls into all 4 categories, so the key to optimize screening is to find cancers in category 2, which is likely best defined by tumor biologic characteristics rather than tumor size and nodal status. 1 Miglioretti DL, Zhu W, Kerlikowske K, et al; Breast Cancer Surveillance Consortium. Breast tumor prognostic characteristics and biennial vs annual mammography, age, and menopausal status [published online October 20, 2015]. JAMA Oncol. doi:10.1001/jamaoncol.2015.3084. 2 Public Health England. NHS Breast Cancer Screening Programme.http://www.cancerscreening.nhs.uk/breastscreen/screening-programme.html. Accessed August 3, 2015. 3 Canadian Cancer Society. Screening for breast cancer. http://www.cancer.ca/en/prevention-and-screening/early-detection-and-screening/screening/screening-for-breast-cancer/?region=bc. Accessed August 3, 2015. 4 Australian Institute of Health and Welfare. Breast cancer screening.http://www.aihw.gov.au/cancer/screening/breast/. Accessed August 3, 2015. 5 Hubbard RA, Kerlikowske K, Flowers CI, Yankaskas BC, Zhu W, Miglioretti DL. Cumulative probability of false-positive recall or biopsy recommendation after 10 years of screening mammography: a cohort study. Ann Intern Med. 2011;155(8):481-492. 6 Munoz D, Near AM, van Ravesteyn NT, et al. Effects of screening and systemic adjuvant therapy on ER-specific US breast cancer mortality. J Natl Cancer Inst. 2014;106(11):dju289. 7 Paik S, Shak S, Tang G, et al. A multigene assay to predict recurrence of tamoxifen-treated, node-negative breast cancer. N Engl J Med. 2004;351(27):2817-2826. 8 National Comprehensive Cancer Network. Clinical Practice Guidelines in Oncology. Breast Cancer, version 3.2015. www.nccn.org. Accessed August 11, 2015. 9 Vaz-Luis I, Ottesen RA, Hughes ME, et al. Outcomes by tumor subtype and treatment pattern in women with small, node-negative breast cancer: a multi-institutional study. J Clin Oncol. 2014;32(20):2142-2150. 10 Chia S, Norris B, Speers C, et al. Human epidermal growth factor receptor 2 overexpression as a prognostic factor in a large tissue microarray series of node-negative breast cancers. J Clin Oncol. 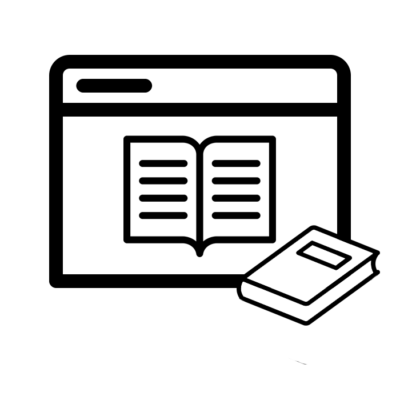 2008;26(35):5697-5704. 11 Yin W, Jiang Y, Shen Z, Shao Z, Lu J. Trastuzumab in the adjuvant treatment of HER2-positive early breast cancer patients: a meta-analysis of published randomized controlled trials. PLoS One. 2011;6(6):e21030. 12 Tolaney SM, Barry WT, Dang CT, et al. Adjuvant paclitaxel and trastuzumab for node-negative, HER2-positive breast cancer. N Engl J Med. 2015;372(2):134-141. 13 Gianni L, Eiermann W, Semiglazov V, et al. Neoadjuvant and adjuvant trastuzumab in patients with HER2-positive locally advanced breast cancer (NOAH): follow-up of a randomised controlled superiority trial with a parallel HER2-negative cohort. Lancet Oncol. 2014;15(6):640-647. 14 Cortazar P, Zhang L, Untch M, et al. Pathological complete response and long-term clinical benefit in breast cancer: the CTNeoBC pooled analysis. Lancet. 2014;384(9938):164-172. 15 Howlader N, Altekruse SF, Li CI, et al. US incidence of breast cancer subtypes defined by joint hormone receptor and HER2 status. J Natl Cancer Inst. 2014;106(5):dju055. 16 Miller AB. Conundrums in screening for cancer. Int J Cancer. 2010;126(5):1039-1046. 17 Marcus PM, Prorok PC, Miller AB, DeVoto EJ, Kramer BS. Conceptualizing overdiagnosis in cancer screening. J Natl Cancer Inst. 2015;107(4):djv014. Corresponding Author: Wendy Y. Chen, MD, MPH, Channing Division of Network Medicine, Brigham and Women’s Hospital, and Department of Medical Oncology, Dana Farber Cancer Institute, Harvard Medical School, 181 Longwood Ave, Boston, MA 02115 (wendy.chen@channing.harvard.edu). Published Online: October 20, 2015. doi:10.1001/jamaoncol.2015.3286.